Trailhead and parking area are on the Kancamagus Highway in Waterville Valley, NH, 19.9 miles from Rt. 93. The parking area is on the south side of the road. At the beginning of the Sabbaday Brook Trail to the Tripyramids is popular Sabbaday Falls. 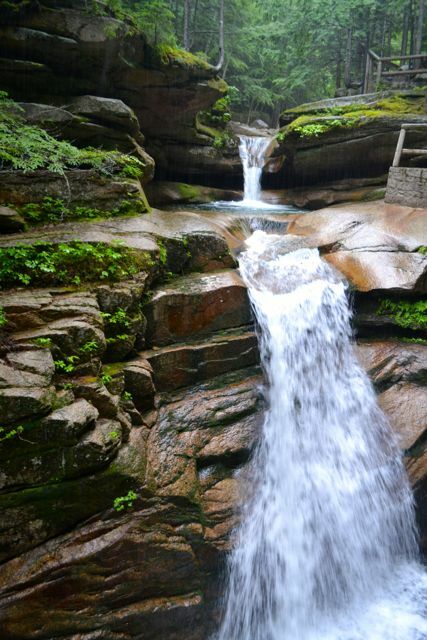 Several fanning plunges, an emerald-colored pool (swimming not allowed), and a mossy gorge make it one of the most scenic waterfalls in the White Mountains. Another great feature of this waterfall is the easy access. Just 0.3 miles along a brookside graded tourist path gets you to pool at the base of the gorge; a short climb up a set of stairs puts you just above the main waterfall, where you will see another pool at the top. The path allows you to admire its beauty from all angles.